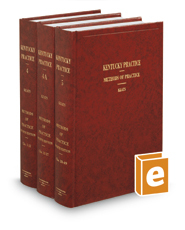 This set is a comprehensive resource for attorneys engaged in the general practice of law in Kentucky. Volume 4 covers Kentucky's Uniform Commercial Code and federal bankruptcy law. Volume 4A delves into a range of subjects, including general forms of business, administrative practice, workers' compensation, wills, trusts, probate, and employment law. Volume 5 covers court proceedings and domestic relations law. Each chapter combines substantive law, practice pointers, checklists, and forms.